The Dodgers got things started early in Tuesday night’s 4-0 win over the Athletics. It was their third shutout of the season, matching their total from the offense side through 10 games. Chris Taylor and Corey Seager led off the game with back-to-back home runs off A’s starter Sean Manaea. It was the first home run for each hitter. Both have been cold to start the season, so it was nice to see them both hit the ball hard and over the fence. Matt Kemp also doubled in the first inning, but he was stranded there. The big story of the night was Hyun-Jin Ryu. After a rough start to the season, Ryu has a fantastic outing. At one point, he retired 13 Athletics in a row en route to a 6-inning, 1-hit performance. He also struck out eight and walked just one. Two-thirds of his pitches were thrown for strikes (60-of-90) in easily his best outing of the season and the best since his Aug. 6 start against the Mets (7 IP, 1 H, 0 R, 8 K). While Ryu won’t be this good all season, he won’t be as bad all season as he was in his first start. In the sixth inning, the aforementioned Kemp did something he hadn’t done for the Dodgers in 3 1/2 years. That familiar finish! 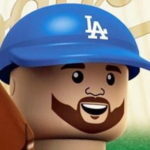 Kemp homered for the Dodgers, and it was his first Dodger home run since winning Game 2 of the 2014 NLDS against the Cardinals. It also pushed the Dodger lead to 3-0. He finished the night 2-for-4 with that homer and double. He had just one extra base hit on the season coming into the game. Cody Bellinger would follow with a single and Logan Forsythe doubled down the third base line to score Bellinger from first base to make it 4-0. Khris Davis, playing left field because there is no designated hitter in the National League (as God intended baseball to be played), doesn’t have a great arm, and Bellinger took advantage of it. Bellinger was the only other Dodger to record multiple hits (both singles). Tony Cingrani gave up a hit in the seventh, but no damage was done. Ross Stripling had a bumpy eighth inning that included a walk and double, but he escaped the inning unscathed. 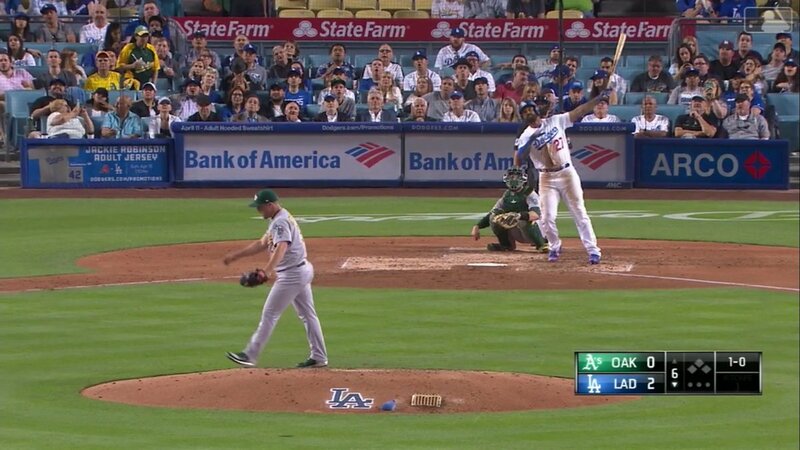 After getting Jed Lowrie to fly out, back-to-back singles by Davis and Matt Olson got Stripling out of the game and Kenley Jansen into the game. I was a little surprised to see Stripling go back out for a second inning after throwing 26 pitches in the eighth (and Scott Alexander warming up), but to each his own. Jansen struck out Jonathan Lucroy and got Stephen Piscotty to ground out to secure the save. He’s not all the way back, but he’s getting there. The Dodgers move to 4-6 with the win. Alex Wood takes the mound in the finale of the 2-game series. He faces off against right-hander Daniel Mengden. First pitch is scheduled for 7:10 p.m. Pacific time.